You are currently browsing articles tagged Sayulita. Here’s an amazing thing: if you drink Manhattans when you’re in Mexico, as I do, you won’t be able to find bourbon—any bourbon—let alone maraschino cherries. Instead, you have to bring your own from the States. However, the trade-off is that you can buy freshly-made, still-warm tortillas just about anywhere. And no matter where you get them, they will be better than anything you can buy in the States. 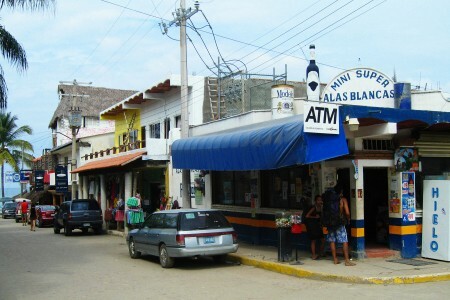 When I’m in Sayulita, I get my tortillas, after a morning at the beach, at this little market called Alas Blancas (White Wings). It’s easy to find because it’s got a giant tequila bottle and a huge beer can on the roof. 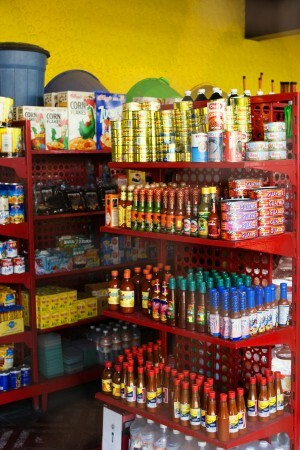 It’s like a little 7-11 except where a 7-11 stocks 20 facings of 50 products, a Mexican market carries 10 facings of 300 products. They do it by not devoting a huge amount of space to the big-margin items like Coke and potato chips. Yes, you can buy Coke and chips at a Mexican market, but you won’t find a whole aisle devoted to that crap. Do you know about Mexican dichos? They are like our proverbs. One of my favorite dichos goes like this: Sin dinero no baila el perro. Which means, Without money the dog doesn’t dance. So if you want the dog to dance, make your own damn tortilla chips. That’s a Lansing dicho. 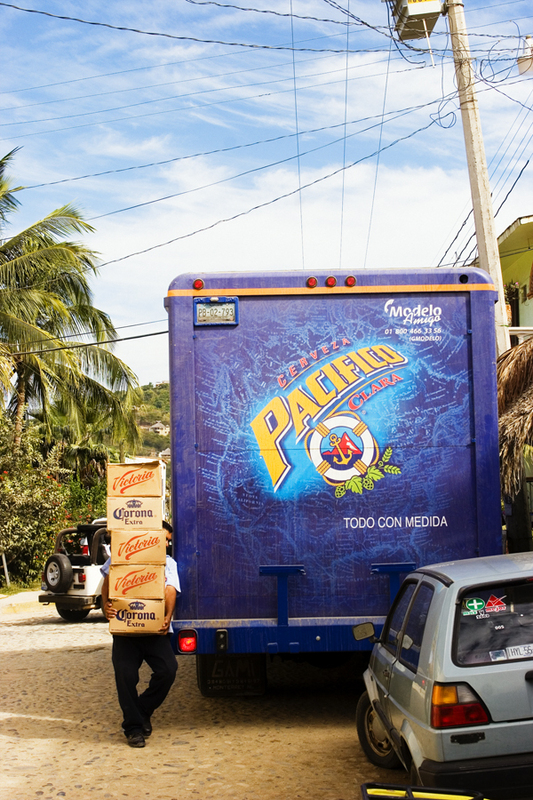 You’ll find some of the best food in Mexico comes from the streets. The same is true of the art. Forget the galleries with their dreamy paintings of Aztec warriors or those faux-Waterford crystal dolphins they sell in galleries along the malecon in Puerto Vallarta. Instead, check out the murals, which are everywhere. Particularly the murals not meant to be art, per se, but explanatory or even advertising. For instance, one of my favorite murals is on the wall of a public restroom on the beach in Platanitos. It’s both useful and amusing. An old guy, who may or may not be blind, is shaking the dew off his lily before an open door. 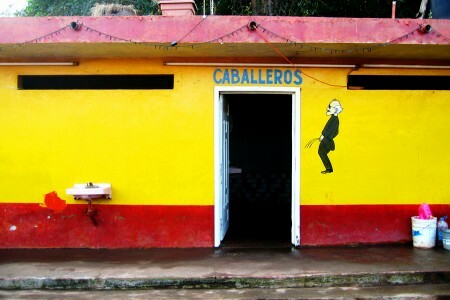 Even if you don’t speak Spanish and know that a caballero is a Mexican cowboy, you’ll be able to figure out that this is definitely the men’s room. A lot of the shops in Sayulita have murals. I like this one just off Av. 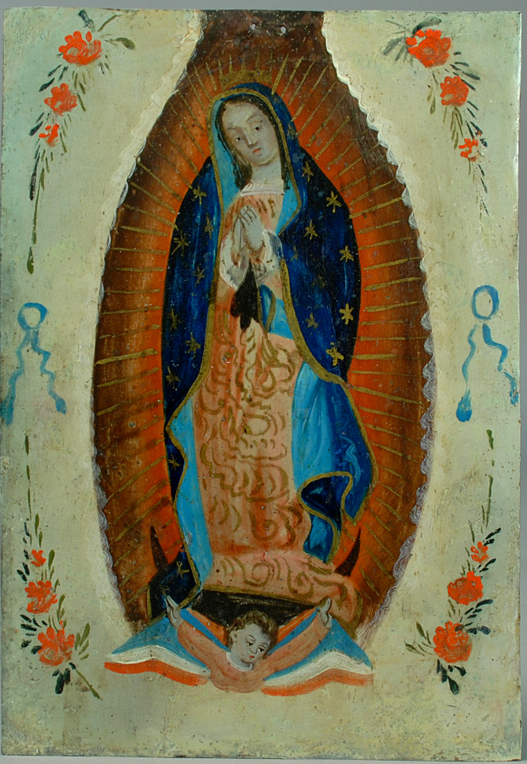 Revolucion—Revolucion del Sueño. 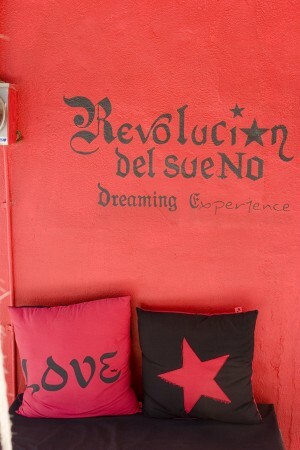 The vivid red color, the pillows on a bench in front of the shop. Since it’s kind of a hippy shop, the name also has double meanings. Revolucion playing on both the street name and some of the Che-centric items inside. And sueño or dreams referencing the pillows and other bedding items as well as the bong pipes in the back of the shop. Even this beer truck, to me, is a great example of Mexican street art. The swirled colors perfectly matching the sky. 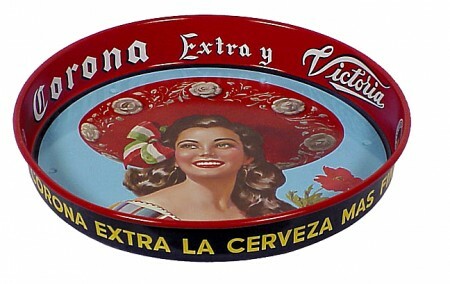 And the driver, pretty much invisible from the waist up, effortlessly balancing five cases of Victoria and Corona beer. A scene straight out of a Mexican version of Cirque du Soleil. There are some very cool stores in Sayulita. One place often overlooked is the Galería Tanana, which I wrote about in the September 2008 issue of National Geographic Traveler. The gallery, founded by Susana Valadez, carries art made by local Huichol (pronounced “wee-chol”) Indians. The Huichol are the folks who use peyote as a sacred form of enlightenment (they believe that snakes bring rain and that they can talk to deer and wolves). I’m not sure I’m ready to get behind all that, but I like the art that some of their spiritual “trips” have encouraged. Like the brightly beaded jaguar heads they sell in the Sayulita store. Directly across the street from Galería Tanana is a shop with a decidedly Paul Bowles feel to it. I think the gay guy that owns it gets most of his stuff from Morocco—pointed slippers and caftans and over-sized furniture. But my favorite store is Gypsy Galería. It’s run by a couple of ex-pats—a mom/daughter team. 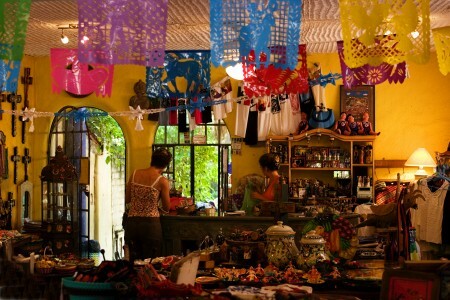 I think the way it works is that Mom is usually traveling around Mexico looking for things to carry in the shop and the daughter lives in Sayulita and is stuck behind the counter in the store. Anyway, they just have a lot of cool stuff, from those vintage-looking cerveza beer trays (Corona used three models: Rosalinda, Tehuana, and Tapatio; the girl above wearing the red sombrero is Tapatio) to milagro-studded crosses, which I happen to collect (I’ve got a wall full of them in the Virgin of Guadalupe guest room in my house near Bucerias). Every time I stop by the Gypsy, I pick up something new. Yesterday it was a retablo—a small oil painting, on zinc, of the Virgin of Guadalupe. Looking a little suspicious of the things going on around her. Which I will hang on the blue wall in my guest room. To, you know, keep an eye on things. One time someone was interviewing me and they asked me what I would like to do if I wasn’t a writer. I can’t remember what I told them…maybe be a bricklayer? But I have the answer now: I’d be a paletero. Which is a guy who makes paletas. Which are like Mexican ice pops. But a paleta is very different from a popsicle. For one thing, they’re usually handmade. For another, the flavors are more imaginative. Popsicles usually come in orange, cherry, or grape (rootbeer or lemon-lime pops are considered “out there” flavors). 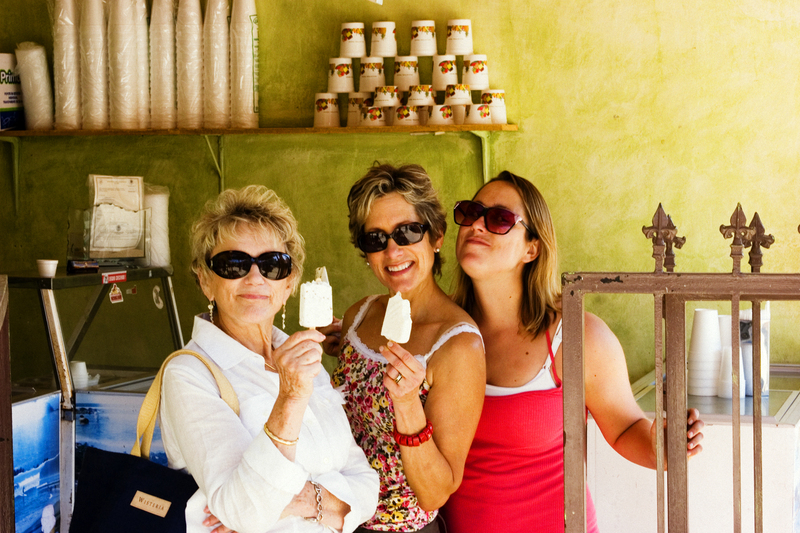 Paletas come in flavors like tamarindo, jamaica (hibiscus flower), and mango con chile. Señor Paleta, which is what I call the paletero in Sayulita next door to Burrito Revolution, makes 25 to 30 different flavors of paletas from arrayán (a type of Mexican guava) to uva (seedless grapes). 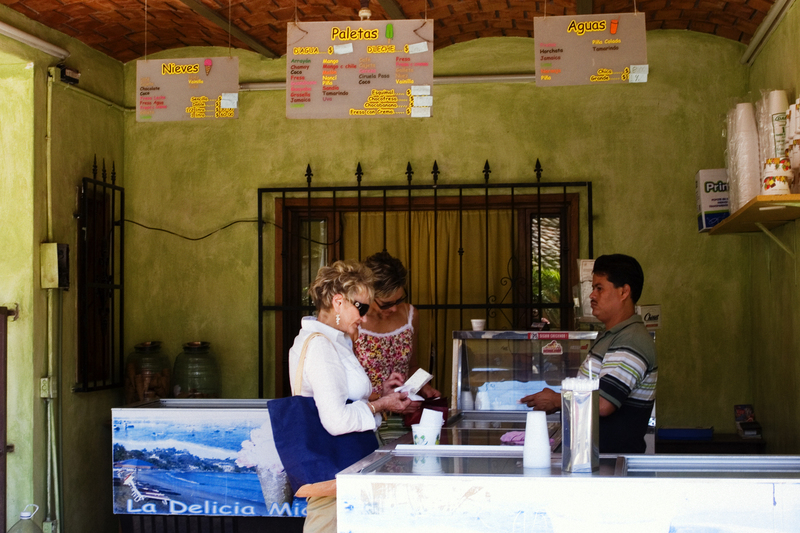 Like most paleteros, Señor Paleta makes two different types of paletas: de aguas and de leche. Paletas de aguas are basically frozen fruit juice. Fresh fruit juice, with bits and pieces of the watermelon or pineapple showing through in the translucent frozen pop. Paletas de leche are creamier and, to my mind, more substantial tasting. I’ve tried Señor Paleta’s jamaica d’agua and it’s yummy, particularly on a really hot day, and the mango con chile is excellent as well, but I have to say that nothing is quite as good as his nuez d’leche. Generally speaking, nuez, which means nut, refers to walnuts. But the secret ingredient in Señor Paleta’s nuez d’leche is, I’m quite sure, pecans. So it tastes a bit like a frozen pecan pie. Which just opens up a whole new range of flavor possibilities as far as I’m concerned. If I were to open a paletería in Sayulita, I could imagine making paletas that tasted of almond rocca or hula pie or even pumpkin. And then who do you think people in Sayulita would call Señor Paleta? Would you buy shrimp from this guy? The best salesmen in the world live in Mexico. In Sayulita, I have seen guys on the street selling sacks of dried camerones, homemade fireworks, the little mango- or apple-flavored sweets called huesitos (little bones), 3-day old newspapers, and 8-track tapes of the Carpenters (the only item I was seriously tempted to purchase; the theme for my high school prom was We’ve Only Just Begun). 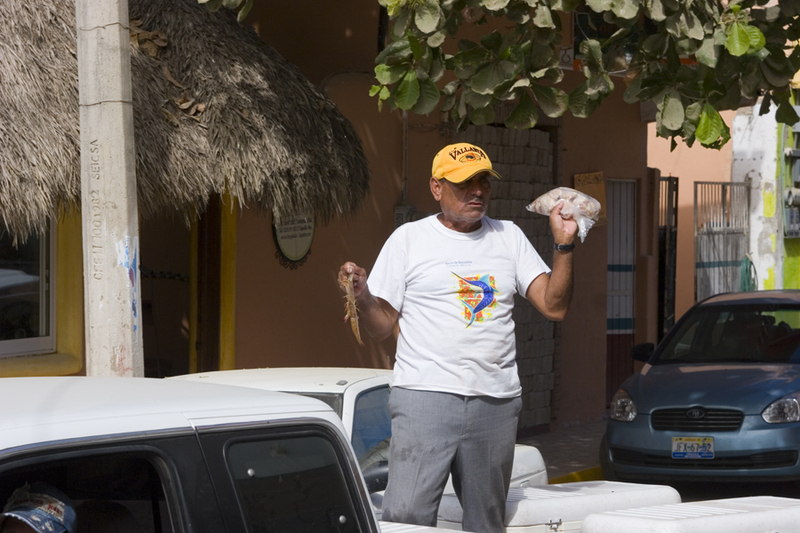 I have a theory that if you are a patient man (and I am not), you could just sit in the plaza in Sayulita and sooner or later, someone would come by offering to sell you whatever it was you needed. Around Dia de los Muertos last year I saw him holding a 15- or 20-lb. snapper high over his head as if it were Super Bowl trophy. I thought about buying it and grilling it up zarandeado-style, which is a local way of marinating a whole fish in soy sauce, lime juice, olive oil, garlic, and chiles—or whatever you feel like throwing in there. It would have been fabulous. Except…I just kept wondering how long this guy had been hauling around this snapper in the back of his pickup truck. I mean, did he catch it this morning? Last night? Three days ago? Same thing with the shrimp he sells. Mind you, it’s 84 degrees here today. So do I really feel like getting a pound of good-sized camerones that have probably spent more time sitting on a tailgate than the average Texas Longhorns fan? 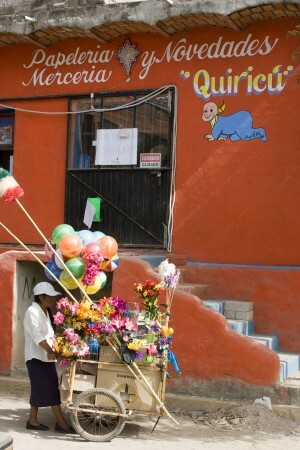 Then there’s this little woman who pushes a cart around the plaza selling balloons, artificial flowers, mops, and 10-foot-long feather dusters dyed the colors of the Mexican flag. I have no idea what you’d do with those. But that didn’t stopped me from buying one. It’s a safer option than shrimp off the back of a truck, don’t you think?